Sergey Kovalev will continue to have his day in court, while also awaiting word on his ordered light heavyweight title defense versus mandatory challenger Anthony Yarde. His next court date, however, could prove a hindrance in any plans to defend his title. A purse bid hearing scheduled for April 8 in the World Boxing Organization’s (WBO) headquarters in San Juan, Puerto Rico will reveal who gets to promote Kovalev-Yarde along with when and where such a bout will take place. At least, that’s how it goes under normal circumstances. A more important date at present moment for Kovalev is April 19, which is when the three-time light heavyweight titlist will learn whether enough evidence exists to proceed to trial for charges stemming from an alleged incident last June in Big Bear, California. According to court documents, the alleged victim—Jamie Frontz, who has also filed an $8 million lawsuit against the boxer—reported to authorities of her being attacked by the boxer after rejected his advances at a party held earlier in the evening. Kovalev and one of his friends allegedly followed Frontz to her cabin, the location of the alleged attack where she claims to have suffered a broken nose, a concussion and a displaced disk in her neck after being punched in the face. Kovalev was arrested on June 9 and charged with assault by means of force likely to cause great bodily injury. The alleged victim told police Kovalev and one of his friends followed her back to her cabin, where the alleged attack took place. She said his punch caused a badly broken nose, a concussion and a displaced disk in her neck. The boxer was freed on a $50,000 surety bond and entered a Not Guilty plea during a disposition hearing last August. 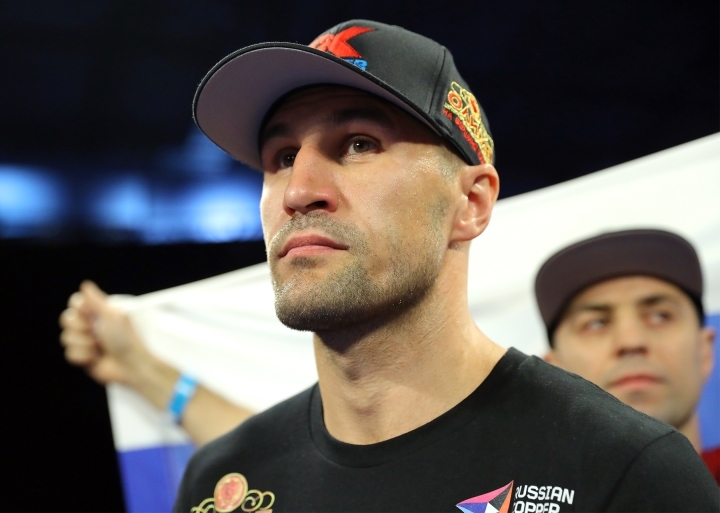 The latest development in the state’s case versus Kovalev (33-3-1, 28KOs) came on Thursday, when a preliminary hearing was held at the Superior Court of California in San Bernardino County. The purpose of the session was to determine whether enough evidence exists to move forward with a trial. Should the case move forward, formal criminal charges will be filed against the boxer. If found guilty, Kovalev faces anywhere from two to four years in prison. By that time, it will already be determined when and where his title defense versus Yarde will take place, although a trial for alleged felony assault could complicate any such plans to fight outside of the United States. Kovalev’s promoter, Kathy Duva—whom served as a character witness during Thursday’s hearing—called for a purse bid hearing after failing to come to terms with England’s Yarde and promoter Frank Warren during the allotted negotiations period. Duva told ESPN’s Dan Rafael of plans to stage the event in Los Angeles-based Kovalev’s hometown of Chelyabinsk, Russia. A June 1 fight date has been set aside, with the event to be carried live on ESPN+ in the United States and BT Sport in England. Of course, she—or anyone with a vested interested in staging the event there—would have to emerge as the high bidder during Monday’s hearing in San Juan. Yarde’s team, naturally would prefer the event to take place in England, which at least contributed to the impasse. There also remains the concern of Yarde (18-0, 17KOs) not going through with the fight. The 27-year old from Essex, England was named the mandatory challenger following a 5th round knockout of Travis Reeves this past March in Kensington, England. His take after the fight was a general willingness to move forward with a title fight if so ordered. Suffice to say, the outcome of Monday’s purse bid hearing could become a significant conversation piece not just among the two camps but also between Kovalev’s legal team and the prosecution’s office regarding where he needs to be for his current felony case.